Written by: Ret Talbot, Matt Pedersen, Mathew L. Wittenrich, Ph.D., Foreword by: Dr. Gerald Allen with Martin A. Moe, Jr., Roy Yanog, V.M.D., and Thomas Waltzek, D.V.M., Ph.D. Normally you don’t judge a book by its cover, but in this case you can make an exception. The cover has a pair of the bizarre Banggai Cardinalfish on the cover that stare right at you with their striped eyes saying, “Read me! Read me!” Of course, and interesting animal will always get my attention. The next thing I noticed was the weight. 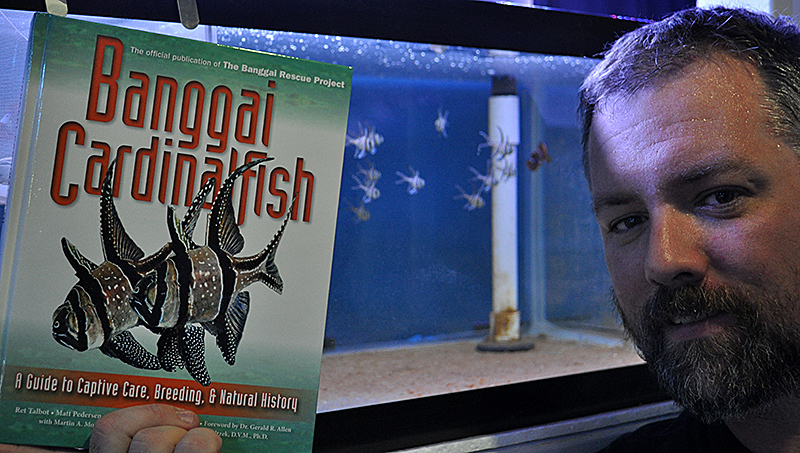 This book consists of 304 pages of pure knowledge about only one species, the Banggai Cardinalfish. Let us flip the book open to the table of contents now to see what lies within! I will say, this book is extremely scholarly looking. It looks just like a college text book. This was certainly aimed to those of us who are truly obsessed with the hobby. The Table of Contents is two full pages long with seventeen chapters, acknowledgments, a foreword, introduction, full glossary, references, index, about the authors, and and photo credits. It is very easy to navigate and the descriptions leave no room for confusion. The opening spread for the Appearance & Anatomy chapter, featuring artwork by project artist Karen Talbot. Chapter 1: “In Search of the Banggai Cardinalfish” takes a simple “Locate, Capture, Study” story into an epic battle against time and personal stress. The first chapter alone could have made a great film documentary. It definitely put into perspective how difficult it can be to locate new creatures, especially when they are in low populations. This was a very moving chapter and had me on the edge of my seat the entire time. 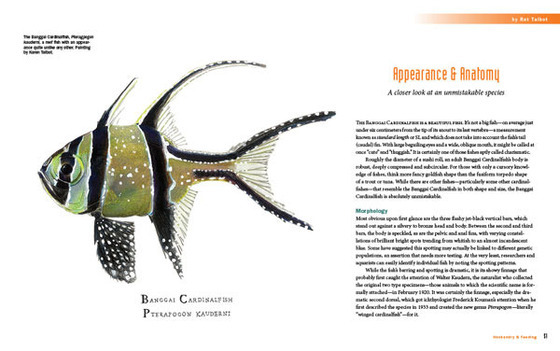 Chapter 2: “An Endangered Species” gives you the Banggai Cardinal Census. After reading this chapter it is no surprise why this project is so important. The extremely limited populations really amazed me, especially since these fish are so readily available in pet stores, even in the middle of Indiana! Opening spread for The Cardinalfishes chapter. 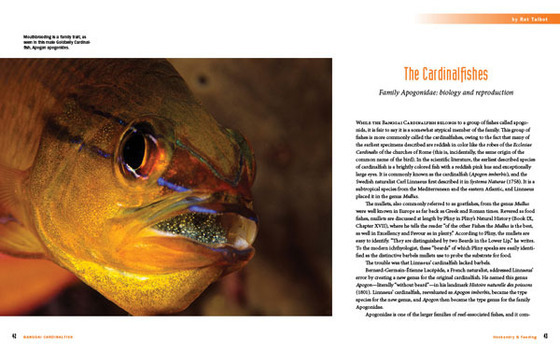 Chapter 3: “The Cardinalfishes” demonstrates the biology of the cardinalfish and shows just how diverse the species actually is. From bright red to black and white, the cardinalfish is a well adapted putt-putt of a fish that lives amongst the reef. Chapter 4: “Appearance and Anatomy” goes into great detail about the fish’s anatomy and characteristics. There is a great diagram that shows the fish’s internal organs and bones. They have a great illustration of the fish’s skeletal structure that would make an amazing poster for anyone’s fish room. Chapter 5: “Origins & Discovery” is fairly self explanatory. The authors go into a quick history on the discovery of the species and talk about where the fish lives. The chapter was quite informative and brought up the point that the human impact on the ocean is only a “recent phenomenon.” The Banggai Cardinalfish used to be much more populated before us humans started to seriously damage the planet. Chapter 6: “Life History” goes into the evolutionary traits of the fish. It talks about why they evolved the way they did and what they “lost” in the evolutionary process. The fish has evolved with the assumption their environment wasn’t going to change, which is one reason they are in this mess. This definitely put into perspective how much of an impact a slight change can have on a fragile species, or any species for that matter. All life forms on earth are made for a reason. When that reason is no longer applicable the animal dies or evolves. 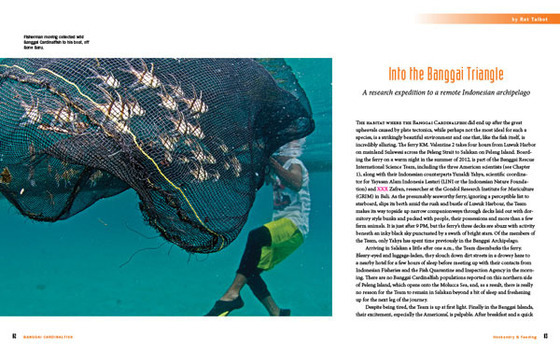 Into the Banggai Triangle opening spread. Chapter 7: “Into the Bangaii Triangle” takes you on a tour to the home of the Banggai Cardinal. The “triangle” is an Indonesian archipelago, or group of islands, that is home to many types of creatures. Not only do they explain the physical properties, but they go into detail about the climate as well! This paints a very real picture of the type of place these creatures reside. Chapter 8: “Home Waters” takes you even deeper into the environment of the fish. They explain what the fish hunts, gets hunted by, lives in, on, around…and even talks about the social structure found in schools of these fish. No factor is left untouched. Chapter 9: “The Virus” talks about Banggai Cardinal Iridovirus, or BCIV. This is a viral infection that can take out a whole school of fish and was a struggle to keep at bay. They talk about the economic risk of spreading the virus and what they did to try prevent and cure it, however the virus was not found to be curable and is in fact very fatal. Chapter 10: “The Fishery & The Future” goes into the process of harvesting wild fishes and how they keep it sustainable. Overfishing can quickly screw up the local food chain so managing wild populations is extremely important. From locating the fish to transporting it to the holding tanks, they leave no point out. Chapter 11: “Husbandry & Feeding” talks about basic care of the breed and could easily have been it’s own short book. If you are new to the species then this chapter alone is perfect for you! Chapter 12: “Urchin Commensals” was the coolest chapter. As an artist, creativity is key. Science is not normally known for being artistic but with the fish in desperate need of a host in an algae free environment the faux urchins were the most innovative aspect of the whole project. Introducing a ball of putty with toothpicks stabbed through it seems pretty basic, but the concept was spot on and the fish love them!!! Truly an awesome chapter and something that can be of use to even the average hobbyist. 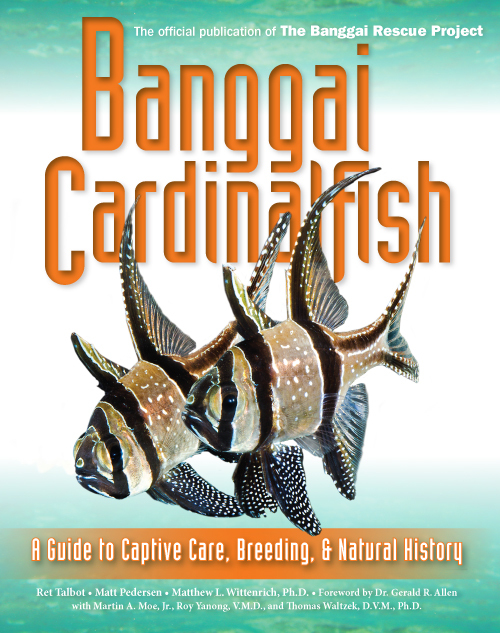 Chapter 13: “Banggai Breeding 101” takes you behind the scenes and tells you every aspect about breeding. If you want to have a go at breeding, this is the fish to try on! They go into great detail on what does and doesn’t work. After this chapter you cannot go wrong! Chapter 14: “Advanced Breeding” takes it a step further and shows you how to breed massive quantities, along with troubleshooting any issues along the way. There is a lot to maintaining thousands of babies! Chapter 15: “Banggai Breeding Business Primer” is the guide to running a fish breeding business. They explain what you need, what you will run into, and how to profit from them. This could also be its own small book. It is very detailed and gives you a good idea what to expect. Chapter 16: “Planning a Marine Fishroom” is another very useful chapter. They talk about various methods of climate control and how to keep it organized and maintainable. This was a great read and I even implemented a few ideas into my own room after reading this. Chapter 17: “Conservation Breeding” is about how they are preparing for Doomsday, not Armageddon, but the day the Indonesian government bans wild caught exports! The goal is to breed enough to have an inland supply that we can use to stock our home aquariums for years to come rather than rely on wild caught specimens. They also talk about repopulating them in their habitats and how to keep the genetics of a wild animal, though they feel their focus is best aimed towards Cardinalfishes for the hobbyist. If you like fish, conservation, and science you are going to love this book! There is no stone left unturned in the 304 pages of amazingly in-depth text and pictures. After reading this book, which took longer than expected due to the extreme detail, I feel very educated on the fish and what it takes to keep them on our planet. It is amazing that all of this is dedicated to a single fish. The writing was not boring like a standard text book either. That was the best part. Even the most biologically inclined chapters felt like I was being taught by a human and not an encyclopedia. This is a great read and gets a 10/10 score! For more about the book and the Banggai Rescue Project please click here.